Synopsis: “Dunkirk” opens as hundreds of thousands of British and Allied troops are surrounded by enemy forces. Trapped on the beach with their backs to the sea they face an impossible situation as the enemy closes in. The story unfolds on land, sea and air. RAF Spitfires engage the enemy in the skies above the Channel, trying to protect the defenseless men below. Meanwhile, hundreds of small boats manned by both military and civilians are mounting a desperate rescue effort, risking their lives in a race against time to save even a fraction of their army. Christopher Nolan's Dunkirk (2017) is not your average WWII epic, it's a non-linear web of suspense and dread, as 400,000 Allied soldiers find themselves trapped on a beach in Dunkirk, France surrounded by German artillery with no hope of a proper military evacuation. We follow three three cross-threaded narrative lines, first we have a low-ranking British soldier named Tommy, the sole survivor of a German ambush in Dunkirk who only just makes his way to the beach, hoping to find a way off the sand through any means necessary, a few are bear successful, but somehow he keeps landing back at the beach. Then we have British a father and teenage son who along with a teenage friend sail their pleasure yacht towards Dunkirk across the English Channel as part of a civilian evacuation contingency enacted by the Royal Navy, along the way they pick-up a British soldier stranded on the hill of a sunk boat, the soldier is shell-shocked and is less than thrilled to discover hat the trio are headed back to Dunkirk from which he just came! Lastly, we have three British Spitfire fighter pilots en route to France, along the way encountering various enemy dog fights and Nazi bombers, they are all running low on fuel, but are charged with providing as much air support as they can muster. Eventually all three stories converge allowing for several epic set pieces to be seen from various vantage points. 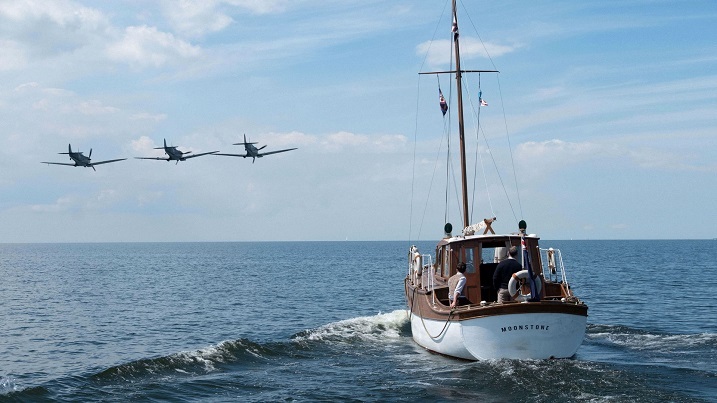 These include an amazing aerial fight that is breathtaking, captured vividly using real Spitfires planes with IMAX cameras strapped to them, it's impressive and dizzying, this film puts you in the pilot seat like few before it. 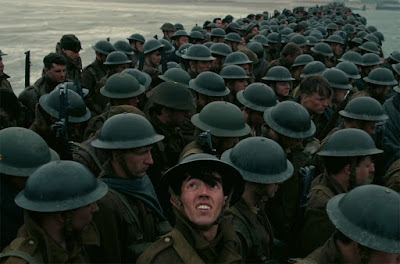 For me part of the beauty here is the non-reliance on digital effects to recreate the scenes, it's shot during the same time of the year on the same beachfront as the historical event, Nolan and crew went to great lengths to achieve period authenticity, including a massive rebuild the mole which extends into the sea for what looks like forever, crammed with desperate soldiers awaiting evacuation, sitting like ducks waiting for an aerial attack. They used real Spitfires for the aerial battles, they also used the real little boats used during the historic evacuation, all adding up to a film that has some serious depth and weight to it, so many films are made using CGI which just doesn't have the weight of reality, this suffers non of that, this is epic from start to finish. 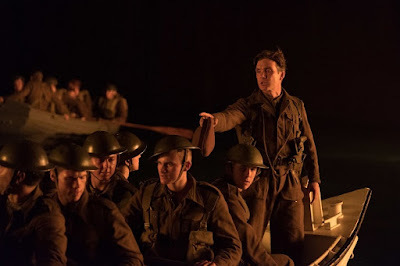 I don't think my wife was too keen on the non-linear narrative structure, or the fact that the characters aren't deep and developed, but as an epic tone-poem of a sort this really is steeped in nail-biting suspense and dread, a great war film through and through. 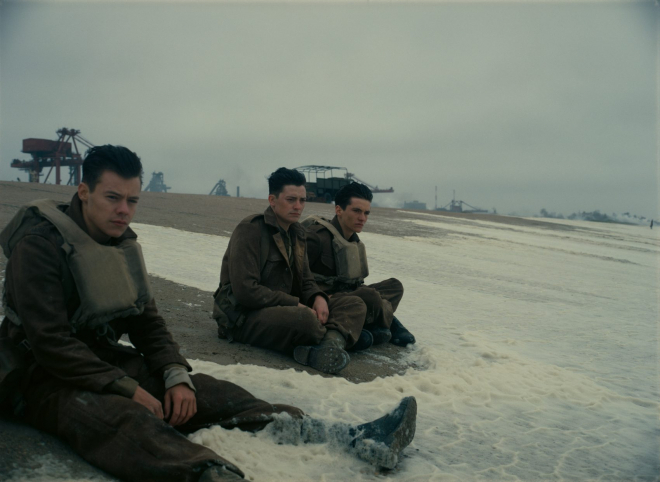 Audio/Video: Dunkirk (2017) arrives on three-disc 4K UHD Blu-ray, Blu-ray, and Digital format. The film is presented separate 4K UHD Blu-ray and Blu-ray discs containing the main feature with the extras dedicated to a third Blu-ray disc containing only the extras. The main feature is framed in stunning (and alternating) 1.78:1 and 2.20:1 widescreen, this is an image I first saw on large format IMAX, so without dinging the 4K presentation I will say it loses a little in translation, downgraded to mere home video, but the 4K is stunning all the same. 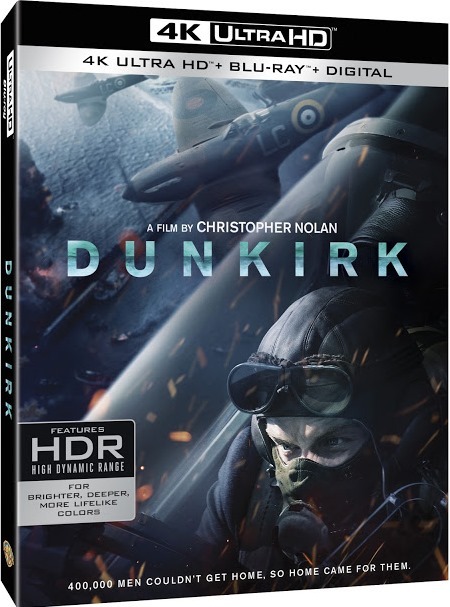 The visuals are deep and detailed, the grey tone looks wonderfully crisp, the image as some serious depth, from the claustrophobic shots of the crowded mole, to the interiors of a doomed destroyer, to the spitfire dog fights above the waters, everything here is stunning. 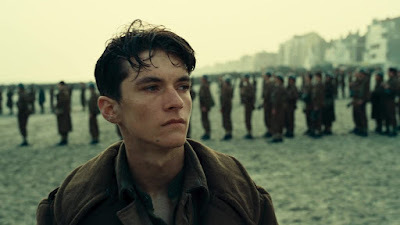 No Atmos here folks, just Nolan's preferred DTS-HD MA Surround 5.1 audio, and it's sound great, the dive-bombing planes and Zimmer's anxiety inducing score are crisp, powerful and bombastic. Scenes of eerie quietness are immersive while the scene of a beach bombing is appropriately deep, the opening scene of British soldiers coming under fire is crisp and startling, both during by IMAX viewing ad during the home viewing. Optional English subtitles are provided. Now onto the tasty extras, there's a second Blu-ray disc dedicated to just extras, which add to nearly two hours worth of in-depth featurettes, divided into the following categories: Creation, Land, Air, Sea, and Conclusion, they go deep into the crafting of the film, my favorite stuff being how the actual little boats from the Dunkirk extraction were used during the filming, the rebuilding of the mole, and Zimmer's use of the Shepard's tone to create unease and ramping tension with the score, it's all fantastic stuff. grand and frightfully claustrophobic, it definitely lives up to the hype, and this 4K presentation is phenomenal, it wowed me at the IMAX and it wowed me at home.